When Anne-Marie Slaughter stepped down in 2011 as director of policy planning under then-secretary of state Hillary Clinton, she encountered disapproving faces and cringeworthy expressions of sympathy: “It’s such a pity you have to leave Washington.” She was going back to Princeton University both to avoid losing tenure and to be with her husband and two sons, who had stayed behind when she moved to Washington, D.C. to work for the U.S. Department of State. She refused to hide either of these motivations. The following year, Slaughter published an article in the Atlantic magazine read by millions, “Why Women Still Can’t Have It All,” which sparked a renewed debate on the continued obstacles to genuine equality between men and women. 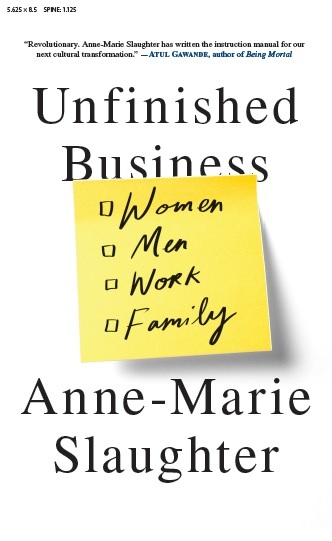 Slaughter—who is currently president and CEO of the New America think tank—has now written Unfinished Business: Women, Men, Work, Family, a highly insightful examination of American views on work-life balance. In her new book, which was published in September 2015, Slaughter not only enumerates the tensions that women face between their personal and professional lives, but also maps out a path for change. The former policymaker sheds light on cultural norms and stereotypes that have held back women for years in a society where balancing home and work is seen as largely a woman’s problem. Slaughter explains what steps must be taken to achieve genuine gender equality with regard to the work-home equation. The solution begins with an understanding that comprehensive change must take place not only in the workplace, but within society at large. She addresses how women face cultural pressures to be the primary caregivers for children, as well as the elderly, but at the same time are punished if they temporarily leave full-time positions to spend time as caregivers. “Putting yourself forward is important at the right moment, but so is pushing back against rules, structures, attitudes, and assumptions that still support a straight-on career path and stigmatize any worker who deviates from it,” she argues. Slaughter also describes how society regards men who make the choice to serve as caregivers as somehow less masculine, and calls for a men’s movement in which planning for a career includes adding in the family variable. While the author emphasizes that the work that women of her mother’s generation did in the home was as important as the work that men traditionally did outside of the home, the challenge for women now is to forge a new path for themselves. “In the long quest for gender equality, women first had to gain power and independence by emulating men,” she writes. “But as we attain that power and independence, we must not automatically accept the traditional man’s view—which is really the view of only a minority of men—about what matters in the world.” Slaughter challenges concepts like being a “super woman” or taking the “mommy track,” and recognizes that the mantra she grew up with—“you can be whatever you want”—is true only when having the necessary help. For Slaughter, the workplace has undergone positive changes over the past 30 years. However, it still needs to transform into a truly fair and equal system where working from home, asking for schedule flexibility, or stepping down for a few years to take care of family responsibilities is not seen as a complete detachment from one’s career or an inexplicable gap on a résumé, but rather as a normal phase of life that at least half of the country’s workforce will experience at least once.